The Lassalle Champagne House was established in the village of Chigny-Les-Roses on the Montagne de Reims in 1942. Their Champagnes are elegant, tightly knit and structured. When the patriarch Jules Lassalle passed away in 1982 his wife, Olga, and their daughter, Chantal Decelle-Lassalle, took over the estate. In the 1970s, Kermit Lynch was the first to begin importing artisanal, grower Champagne and the Lassalles have been in the KLWM portfolio longer than anyone. Champagne J. Lassalle works with all three varietals authorized in the region (Chardonnay, Pinot Noir, and Pinot Meunier) on sixteen hectares of vineyards- all of them premier cru. The tough, hardworking women of this house continue to follow the vinification methods established by Jules in the 1940’s. They use the same wooden basket press he installed in the winery over fifty years ago, pressing and vinifying the individual plots separately. This is one of the rare Champagnes that has been allowed to finish its malolactic fermentation, just like the great whites from Burgundy’s Côte d’Or and all Lassalle cuvées are aged extensively once in bottle—even the non-vintage cuvées, which are a minimum of five years old. This results in an astonishing complexity and depth from the beginning of their range up to the luxury cuvées. 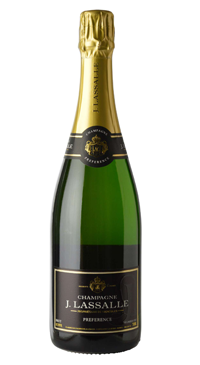 The Brut Preference 1er Cru is a blend of 60% Pinot Meunier, 20% Chardonnay, 20% Pinot Noir. It ages 48 months on the lees before disgorgement. The dosage is 8g/liter making this wine a brut style.